Our Shea Essential Facial Rejuvenation System consist of 4 superior products. All Natural Liquefied Black Soap, All Nature Witch Hazel Extract, Shea Butter Facial Scrub and Shea Essential Rejuvenation. This System is six months of product designed to rejuvenate and protect facial skin. Our Shea Essential Facial Rejuvenation Solution is designed to perfectly moisturizes the face, stimulates collagen production, improves the skin’s surface structure, smoothes out wrinkles and facilitates the skin’s ability to retain moisture (rejuvenate). This System is designed to moisturize, rejuvenate and protect facial skin. Shea Butter Facial Scrub is a creamy textured facial scrub with tiny jojoba beads that safely and gently exfoliate (remove dead skin cells) the face. This is a 90% Organic Facial Scrub with organic rooibos red bush tea botanical extract (a free radical scavenger). Our Facial Scrub will leave your face cleansed, tighten and polished. This Treatment will prepare your face to be regenerated and rejuvenated by our Shea Essential Rejuvenation. I have used shea butter for several years. It's hard to find consistently good products. I have just started using Organic Shea Butter Hut products and am very happy with them. 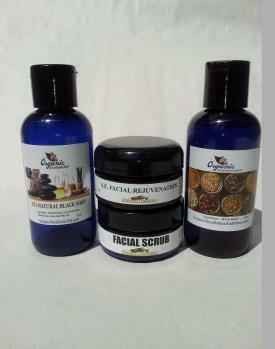 The Black Soap, Witch Hazel, and Essential Rejuvenation are easy to use, smell very pleasant and seem to work very well. I'd recommend these products to both men and women that want to keep their facial skin in good condition.